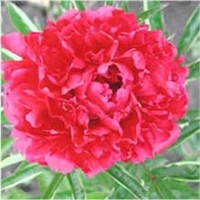 A striking, deep red Japanese form peony. Double blooms that are accented by silver along the edge of each petal, creating a striking effect. Compact plant with rosy lavender red blooms. 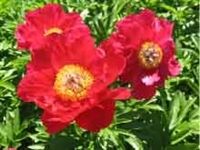 Lovely, single carmine red blooms that are accented by yellow centers. Strong 32-inch stems support a wealth of red Japanese-form flowers. A great addition to any rock garden or border front. 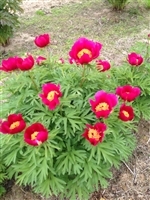 This hybrid peony blooms open cherry blossom pink that transition to more of a salmon. Opulent ruby red double blooms. Battle Flag is a Japanese style bloom with deep red guard petals surrounding matching staminodes that are tipped in gold. 32 inch stems. Mid-season bloom. Flag-red petals accented by small bright yellow centers on unique lime-green leaves and stems. Deep wine red guard petals with an explosion of white, cream, pink and red petaloid. Deep red colored petals so tightly packed that the blooms nearly form a ball. The dramatic color and neat, compact plant habit will dress up any border. Deep red double blooms, late season.